Harriet Randall was born on May 29, 1870, in Salem Connecticut. After the Civil War, Salem was a small and prosperous farming community. Harriet attended school and showed an interest in the various arts, including music, drawing and dance. In 1892, at the age of 22, Harriet married Fred Lumis, a 29 year old architect. The couple moved to Springfield, Connecticut. It was here Harriet pursued formal art education. The couple enrolled in the Evening Free Hand Drawing School through the Springfield public education system. Harriet continued her instruction with Leonard Ochtman. In 1910, Fred Lumis was appointed City Building Commissioner in Springfield. The new position allowed the Lumis’s to buy a house and build Harriet a studio. 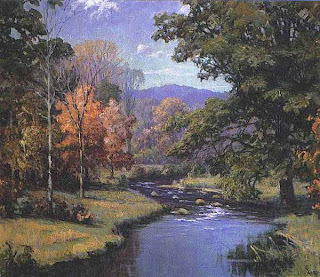 She became active in many regional art clubs and entered her work in numerous exhibitions. At the age of 50, Harriet enrolled in the Breckenridge School of Art and studied there for three years. Under Hugh Breckenridge, Harriet’s work became less restrictive and more colorful—adopting a more impressionistic style. Her work employed broken color and vigorous brushwork. In 1937, her husband died after an operation at the age of 76. Harriet was left with no income except her painting sales which were not enough to provide for her. Teaching became her best solution. Harriet held classes outdoors and at her studio for the rest of her life. An outspoken opponent of the new painting styles predominant at the time, Harriet never chased the trends of Modernism. In 1949, with a group of like-minded artists, she formed the Academic Artists Association. The purpose of the group was to “encourage the showing of realistic works of art in local museums and promote the interests of artists who work in a realistic manner”. 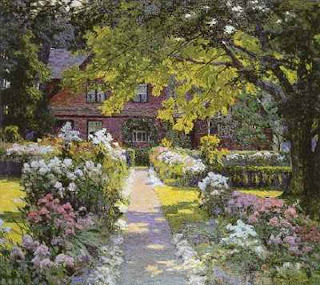 The last years of her life, Harriet continued to paint and teach, spending much of the time in her formal gardens that surrounded her studio. She died in 1953 at the age of 82.